Verragio was founded by Barry Verragio, a man with over 25 years of experience in the jewelry making industry. They claim that their creations are unlike any other rings, and this is certainly true. With fully customizable rings that can be in multiple shades of gold or in platinum, and with the Lumino diamond setting that exposes all the facets of a diamond to the light, a Verragio wedding band is truly unique. It also features unique Fit-Right design to prevent your ring from moving around on your finger. We offer many Verragio wedding band collections - the Parisian, Venetian, Insignia, Classic, Couture and Eterna bands - as well as men's wedding bands. As the name suggests, the Parisian wedding bands are done with a French aesthetic, absolutely sparkling and with gorgeously complex designs. 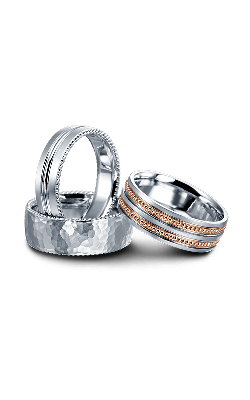 We also carry the Venetian wedding bands, which feature detailed side profiles and intricate, masterfully designed details. These rings are beautifully vintage, yet appropriate for the modern woman with excellent craftsmanship. The Eterna collection features intertwining wedding bands, available in both multiple colors of gold and platinum, with many layers of bands that combine for an intricate vintage design. Gorgeous diamonds run along the bands, with many rings having a larger diamond pinpoint the intersection of two bands. In addition to these wonderful collections for women, we also offer unique wedding bands for men in some of the most original designs available to men looking for wedding bands. These bands feature intricate designs and many types of metal, in addition to including diamonds of the highest quality. Rumanoff's Fine Jewelry has been trusted since 1938, and we are now in the fourth generation of our family. We continue to serve the New Haven County area near Cheshire, Bethany, Wallingford, and Prospect with our friendly service and stylish jewelry. We specialize in designer engagement rings, timepieces, loose diamonds, wedding bands, and fashion jewelry, and offer free sizing services along with lifetime cleaning, polishing and appraisal services for customers who purchase a ring with us. We love helping our customers and pride ourselves on the role we play in the most important moments in their lives. If you have any questions about our products or services, make sure to email info@rumanoffs.com or visit us at www.rumanoffs.com.